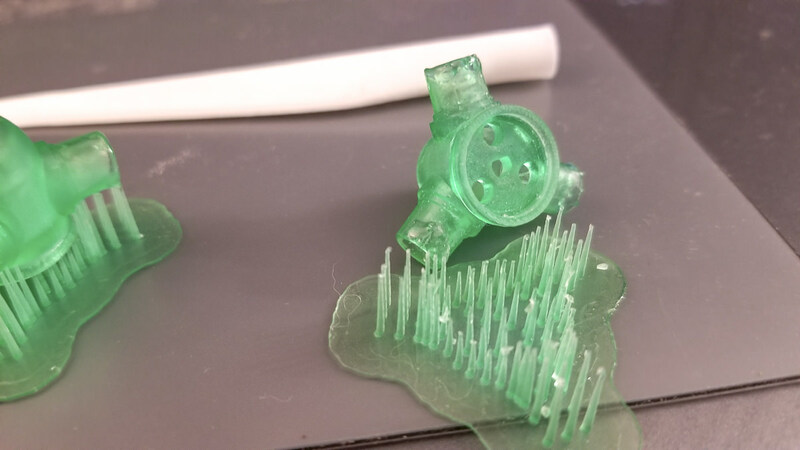 I for one, think she dropped the ball by not including any 'calibration' parameters on the print enabling a literal use of the desire to print her mini "for science".. I read this quick and thought you typed "std". Ok, let's try a new part. I designed a turbine hub to fit my other 3D printed blades. One thing I notice here are drips of resin hanging on at the end of the posts. Before removing the part from the plate, I've been tilting and shaking it above the resin vat to let as much of the excess resin drip back in. Then I dip the part in a container full of 91% IPA and give it a good swishing, followed by a rinse in water, and repeated one more time. Granted there is a lot of 'inside' on this part to get drips out of, but it seems like the drip was already partially cured, so I'm not sure what exactly is happening there. This one barely sat for 5 minutes after the print completed. Nonetheless, in this case, the drips were easily filed off and not a bother since those posts are hidden inside the blades. The important parts are wonderfully smooth where they should be smooth, and crisp where they should be crisp! And the hub fits over the D shaft of the gearmotor exactly as measured! Wow, this 3D printer looks like the cat's meow! Yeah, it sure does, but the hard part is learning how to use a CAD program to design all those wonderful objects. Mark, looks like you are using those 3 dollar gearhead motors from ebay. Nice! I have some on order for future projects. What type of light is around the printer? Maybe you need a hoodie for it. Yep, these are the super slow 100rpm motors. 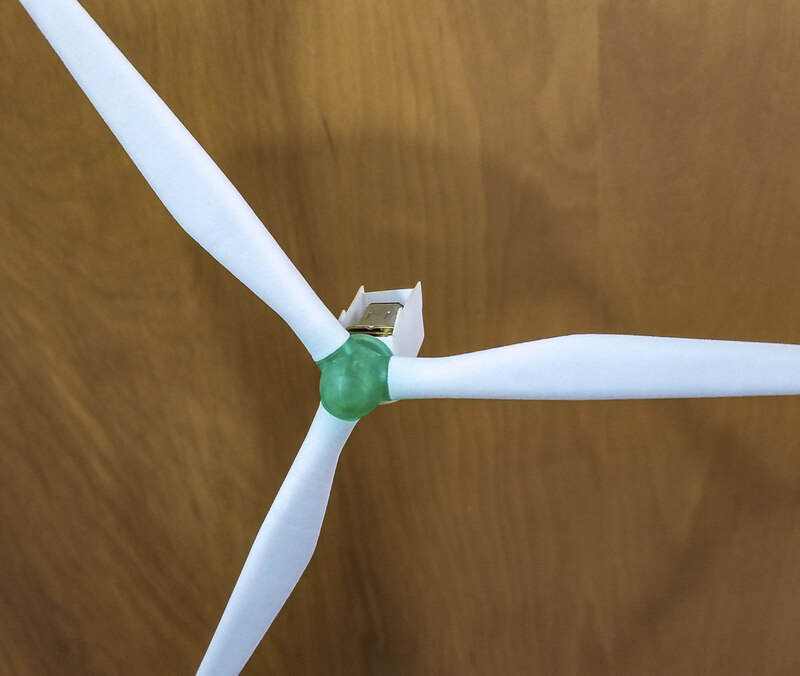 Perfect for wind turbines. The room is completely blacked out. After printing the tank treads, which have zero 'inside' parts and no drips, I'm chalking this up to trapped resin that just wasn't fully cleared before hitting the cure station. And speaking of tank treads, they're done! One of the big downsides of the Photon is you can't see anything for the first 3 hours or so of printing, until the plate has extended high enough to clear the metal walled vat. 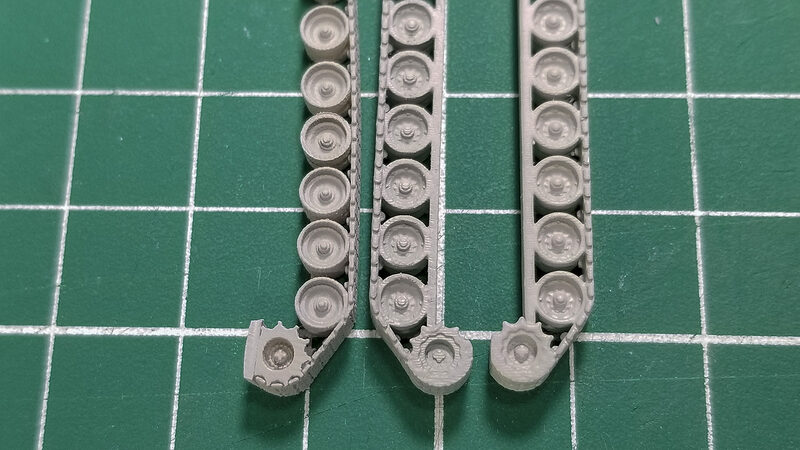 Printing N Scale parts, my longest print is 2:45 so far, so I don't get any visual cue of parts sticking to the FEP or the plate until the print is completed. However there is a distinct, but very faint audible clue to let you know if parts are sticking to the plate. Depending on how much is being cured for a particular slice, after the layer is done exposing and the plate rises up, there is a very faint "fwat" as the cured resin un-sticks from the FEP film. Sometimes it's hard to hear over the stepper motor. I checked in on the Tank Treads several times throughout the print run, and was pleased to hear a "fwat" all the way through. Here they are, 4 treads for 2 tanks. Here's the side by side with MTL original, FUD, and Resin. I really need to get a primer coat on the two prints for a true comparison. You can clearly see the layers along the Resin tread, however I expect primer/paint will help a lot. This (and everything else so far) was printed at 50 microns/layer. I have yet to try 25 microns. 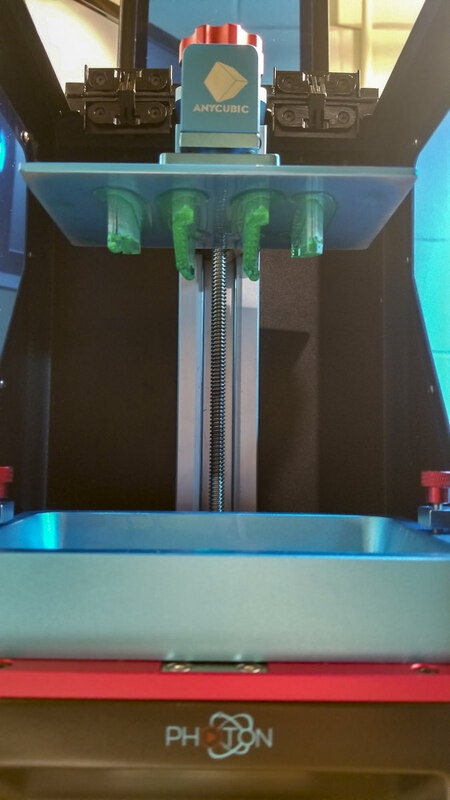 EDIT: The reason for printing at an angle is to reduce suction forces, which if are too great can cause the layer to be ripped from supports and stick to the FEP as the plate moves up and down between layers, causing a failed print. In this case, the part is small enough I could probably get away with keeping it flat and eliminate the layer lines across the part. 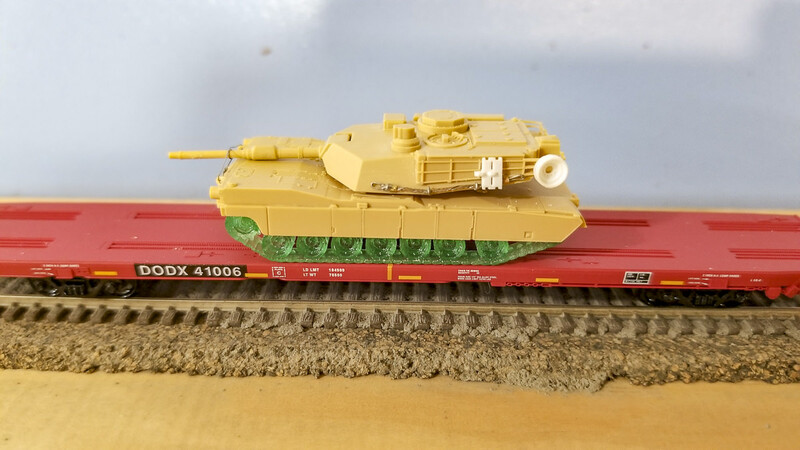 For those following the DODX Abrams thread, yep, the single part replacement makes assembly a 2 minute task instead of 2 hours to assemble individual wheels on the version 1 design. Having no experience with 3D printing, I am curious about the approach you are using to create a model. Why print a totally assembled model as one part, with all the needed supports for things like those wheels? 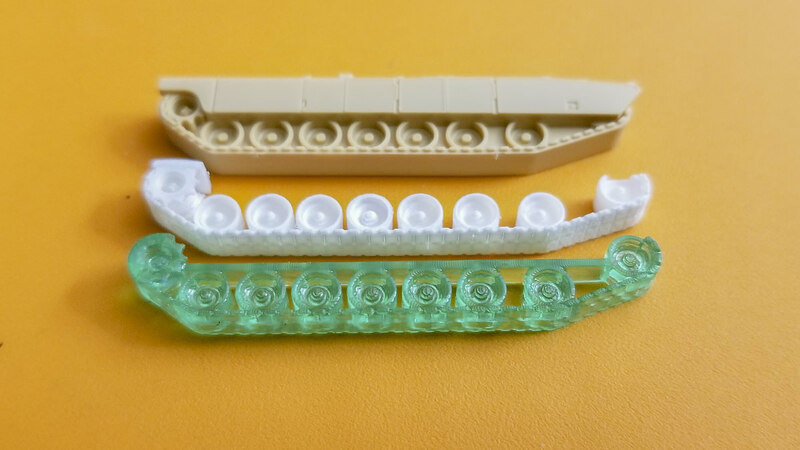 It seems to me that you could more easily print the various parts separately, with less resin waste. As separate parts, it would seem to be easier to sand and finish each part, then assemble them into the finished model. 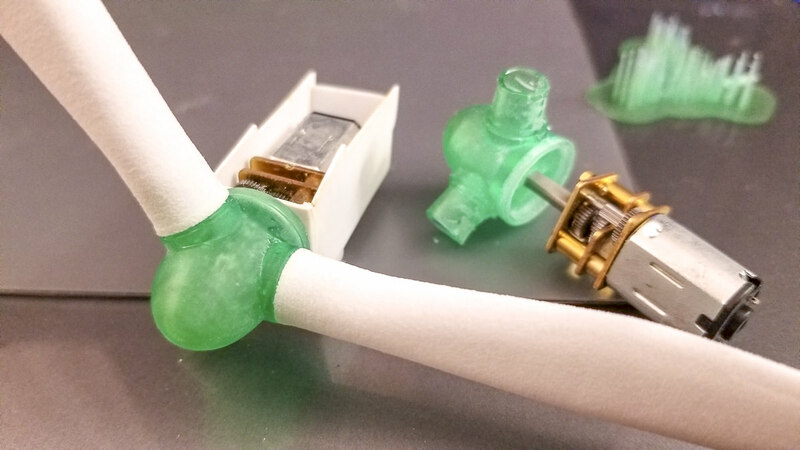 Some parts might actually be made better and more easily by some method other than 3D printing, too. Good question. The answer; it depends on quite a lot of factors. Shapeways has been printing my stagecoach for, gosh, almost 10 years! 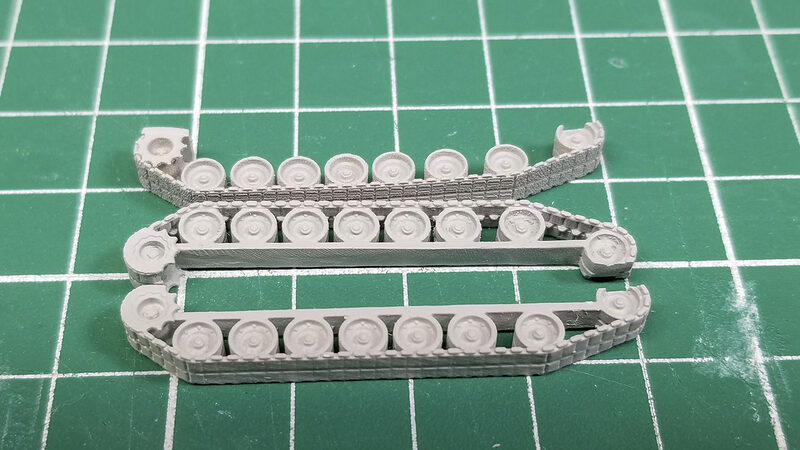 Due to (the old) price model and because FUD is so brittle, it was cheaper to print the wheels separately, and necessary to do so to survive shipping. For the resin Stagecoach, about a 3rd of the material is in the platform, another 3rd in the supports, and the stagecoach itself a 3rd. 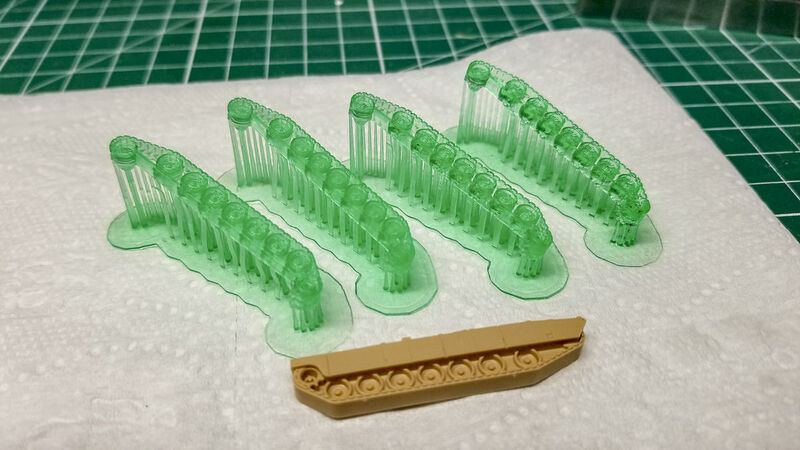 If I were to print the wheels separate (which I already tried) the platform would double, I'd save only 14 supports on the stage coach, but would have to add about 50 more to support the wheels on their own, so overall resin consumption would almost double. With the resin being much stronger than FUD (still fragile, but much safer to handle) there's just no need. For something like a Dry Bulk Trailer (upcoming as my ultimate test for the Photon), things get much more complicated. I'm planning to rely on photo etched details for the ladder and railings, but I'll give them a test print to see how well they stand up. I'm also currently analyzing each pipe, fender, and piece of frame to determine what can be printed whole and what needs to be separated, and which orientation will yield best results, both in quality, ease of assembly, and with consideration for polishing things up if necessary. Mark, what did you end up getting for your UV source to finish the cure??? BTW, those stagecoaches looks awesome. Chris, good for you for ordering one. Together we can learn some tricks and share them. Jamie @lashedup has one of these as well. He said if you don't paint the parts they will get brittle from over exposure to light. A stupid little 3 inch nail polish hood. Amazon is sending a better one. Today's seminar: Primer! What a Difference! Let's dive right in. On the left: FUD primed with Mr. Surfacer via Airbrush. Middle: Resin print primed with Rustoleum rattlecan. Right: Resin print primed with Mr. Surfacer via Airbrush. Winner: Resin print primed with Mr. Surfacer via Airbrush. Gotta admit, FUD makes a big statement showing off that sproket detail! The rest of the inner hubs are crisp, but failed to print the lugs. 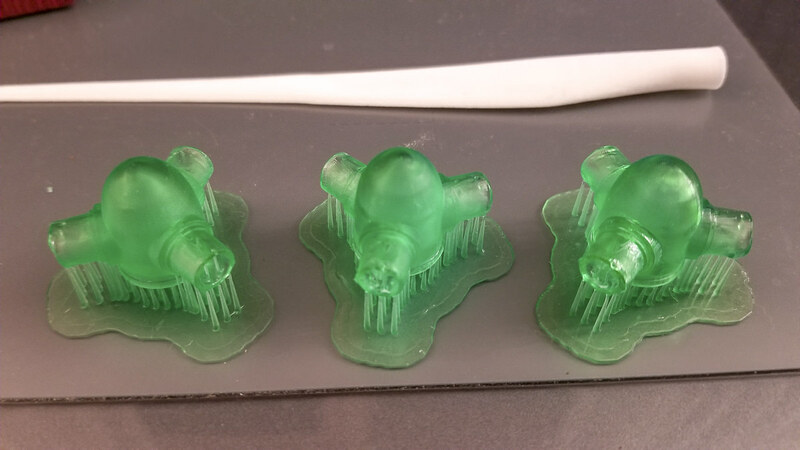 Conclusion: the resin prints may have some mild layering, but that is nothing compared to the deformed layering on the FUD. Maybe I'm being pedantic, but FUD is also (UV cured) resin. Maybe call the other resin "Photon resin"? Can't believe how well those look. Do you think printing them at an angle helped? Of course angling them up like that increases the print time. Keeping fingers crossed that mine works and keeps working. I will need to step up my 3D game as I'm just using Sketchup right now. 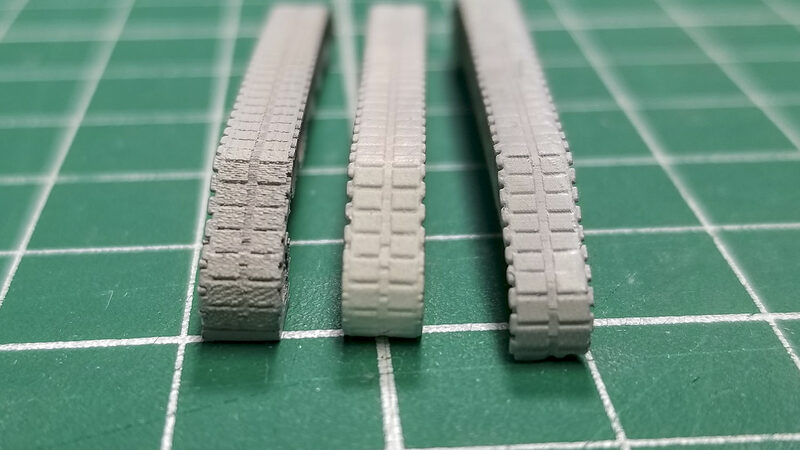 @Mark W , what is your shapeways print orientation for the tread model? I assume this paint test was "out of the box" after cleaning, but had you dragged those FUD treads across some 250 grit sandpaper taped to a flat surface, the print would have been near perfect after prime. Thanks for thinking of supporting the site!